During these raids we would all be confined to the living room under the barrel of some five assault rifles, while the senior officers went through every corner of our home. They would be there till the next morning. At some point these raids became so common they no longer scared us. I remember that we would take a bath, have breakfast, get dressed and go watch cartoons in the living room until the raid was over. Later the raids stopped. But what followed was 24-hour surveillance — our phones were tapped and we all acquired human shadows. Participation has always been important in our family, from household chores to decision making. We learned these positive traits from our parents and, regardless of the hardships, I believe we turned out fairly well. 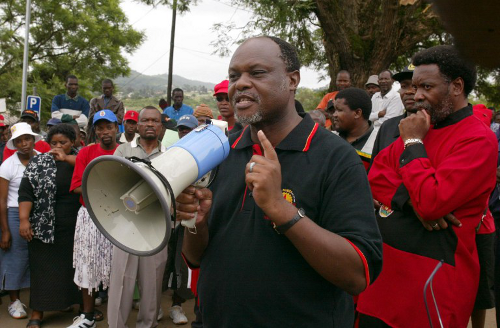 Mzwandile Masuku is the son of Swazi activist and opposition leader Mario Masuku. On May 1 2014 Mario Masuku and student activist Maxwell Dlamini were arrested at a Workers’ Day rally in Swaziland and have been in prison ever since. The prison authorities continue to deny Mario access to the specialised medical care that he needs. Amnesty International continues to monitor the case.